Are 40% Of Life Science Company Facebook Page ‘Likes’ From Fake Users? Facebook has been getting a lot of negative press recently, with a BBC report about fake users as well as this viral post from a company claiming that 80% of the ‘likes’ they acquired through advertising were not from real accounts. Should life science companies be concerned about this matter? Our analysis shows that it may be a issue for company pages which have grown quickly through advertising, with as much as 40% of the ‘likes’ being suspected fakes in our estimation. Here we give best practices for avoiding this problem. Facebook provides a few ‘back door’ ways of analyzing the likes for almost any page, and we should note that we do not know how accurate these numbers are. The purpose of this post is to encourage life science companies to review their own page statistics and advertising methodology. Another ‘back door’ to finding page demographics is to use the Facebook advertising application. To get the data, we began to create an advertisement and went to the next step of targeting users for it. At this step we are able to add the major life science Facebook page names as ‘interests’ and limit the audience to countries in question. These criteria tell us how many people in that country have liked that page, thus showing us how many users we would be targeting with our ad, see the image below for more details. We found that for some reason pages with names longer than two words were not amenable to this method. We discovered that some of the life science pages with the most likes appear to have very distorted demographics, with less than 10% of likes from the US (see Table) and comparable or higher percentages for other, sometimes much smaller, countries. A general rule of thumb for US-based life science companies is that 50% of the business comes from the US, and 50% from the rest of the world. Obviously, since the US is an important market, life science companies should target a much higher percentage of Facebook likes than 10%. It should be noted, however, that the US only represents 20% of Facebook’s user base, and percentages in this range seem reasonable, but not optimal. Based on these two sets of data, we singled out the Invitrogen Facebook page and looked in detail at the country demographics using the Facebook advertising application as described above. 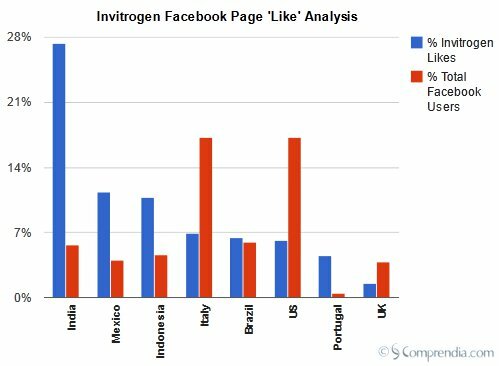 We found that 54% of Invitrogen likes come from India, Mexico, Indonesia, and Portugal, while these countries make up only about 15% of Facebook users. Where does this ‘extra’ percentage of users from these countries come from—misplaced ad targeting or fake users? The fact that the same countries are reproducibly overrepresented in the Facebook likes points to the latter. Based on these numbers, and keeping in mind that we’re making a rough estimation, it is possible that 40% of the Invitrogen likes are from fake users. We welcome other information that could help explain the discrepancies and further analyses of these data. An open discussion regarding how life science companies can better find and engage researchers using Facebook would benefit all involved. These fake users could be considered a plus, because they are more prone to like posts, making them more visible and encouraging others to like the pages because they appear popular. However, they can add spam comments and skew engagement metrics, and this feedback is one of the biggest benefits of having a Facebook page. Proceed cautiously, testing different ads sequentially (not at the same time) with small budgets and viewing demographics and a sample of individual profiles carefully. Do these people seem like they would be your customers? As we noted in November 2011, the Applied Biosystems and Invitrogen page likes seemed to grow quickly, and we may now know why, as presumably they put a lot of money into advertising for quick growth. Try targeting users by their field of study and interests and try to find a combination that is least likely to attract bots and fake users. Target the users of the ‘good’ life science Facebook pages in your ads. A corollary of this analysis is that we learned more about a feature you can exploit, albeit carefully. You can target ads to existing life science Facebook page fans. Obviously, avoid the pages with low % US likes, and target pages like Promega and Sigma Aldrich (sorry guys, it may appear you’re being penalized for doing a good job–consider changing your Facebook page name to one with 3 words so it can’t be targeted…). We know that there is great life science research happening in several of these countries, but currently this is one of the only ways we know to prevent losing advertising dollars on fake users. Note that we’re not suggesting blocking Facebook users in these countries to like pages, we are simply suggesting that you not target them with ads. You can go one step further and target biotech hubs such as Boston, San Francisco, and San Diego. However, even our local biotech group’s page, with mostly regional targeting, has received 11% of its likes from the ‘problem’ countries, and we’ve also seen fake accounts based in San Diego. Build a page with ‘real’ users organically, then target friends of these users with ads or stories (another option Facebook gives for advertising). Use promotions, contests, and provide unique and high quality content on your pages to encourage likes without advertising. Remove fake users, using this guide as a reference, if you can easily identify them. Unfortunately, however, we’ve found that this takes a lot of time and energy. For example, the guide says most fake users are female, however 74% of Invitrogen’s Indian followers are male according to the advertising interface. The best defense is a good offense, however, the key is to not be in this situation and take efforts to not attract the phony accounts. Also, consider pressuring Facebook to take action on removing the fake users. Capture leads from your pages by running promotions or surveys to determine the true percentage of real users. For example, if you put out a promotion to win a free iPad, requiring a valid life science company or institutional email address to enter, what’s the response? Run the same promotion using e-marketing, keeping all of the variables the same (e.g., number of clicks, entry form), and extrapolate the number of real users. For example, if the uptake of your e-marketing campaign for the promotion is 1%, and you have 20 people who respond to the Facebook campaign, with some hand waving you can estimate that you have 2000 real Facebook Likes. Perhaps an iPad may sound too expensive, but how much of your budget and FTEs are being used to keep the page updated? Additionally, capturing the Facebook page leads is obviously a very nice bonus. Consider suspending all Facebook page advertising until the company puts a stop to this fraud. Our eyes have been opened in doing this analysis, we are going to proceed much more cautiously with Facebook advertising now. We just implemented what we thought was a ‘safe’ campaign for one of our own pages and found that 4 of the last 5 ‘likes’ were from fake users. How could we tell? Five ‘likes’ on different pages at the same exact time, then five ‘likes’ at another time, etc. Surely Facebook, with its sophisticated demographics, can spot these bots? Many have pointed out that Facebook has little motivation to remove these fake accounts, because they are making money off of the advertising. We estimate that an ‘average’ Facebook like costs about $1 in advertising, and this could mean that life science companies have spent many tens of thousands on acquiring fake users, which is a real shame. Don’t let interns have a significant role in your social media campaigns, the risk is too great. We’ll forego linking to the myriad problems social media newbies have caused for companies. We don’t know if the issues described in this post were caused by interns, but it’s a plea we can’t make often enough. We should close by saying that we don’t mean to ‘pick on’ Life Technologies, it’s just that they’re pushing the social media envelope and with this comes risk. Additionally, we have seen phenomenal engagement on many of their pages, including the ones with purported fake users. Indeed, it is their success with pages such as the Molecular Probes Handbook Club, for which unfortunately we could not find demographics data, which encourages us about the future of Facebook marketing for life science. I think the logic behind the invitrogen analysis is flawed (meaning that the US % should be higher than the other countries). To accurate define that you would need to know the market cap and other factors like the size of this company in each of the identified countries. For example, it is possible that a good percentage of the likes is probably coming from employees that like the company they work for. A quick look at the invitrogen website shows that Mexico has twice the number of facilities than the US and India has 10 times the number of facilities than the US. Interestingly, these ratios seem consistent with the results on your invitrogen graphics. Thanks for your comment, it would be great if you could have left your name so I’d know who I was speaking with. I do agree that our evidence of fake users is circumstantial, and it did occur to me that the quick growth in ‘likes’ for some Facebook pages could be from LIFE employees. However, for Invitrogen the Facebook page likes from India ALONE are 9,400, which is nearly the number of employees in the entire company, 10,400, according to the LIFE website. I’m sure LIFE does not have most of its employees in India, and also it would be very difficult get 100% adoption of a policy such as this, so the numbers don’t add up. We strongly believe fake users must account for part, if not all, of these discrepancies. However, your point is well taken, perhaps a policy was put in place and account for some of the differences. Also, if part of the glut of likes from these countries is from employees liking their own company Facebook pages en masse, shouldn’t this practice be concerning, since it affects the popularity of the posts? Thank you for posting this information. I’ve also noticed some oddities in Facebook demographics, and I’ve found very little information to explain the results. I manage the FB page for the Ladd Observatory at Brown University which currently has about 12K likes. One important difference between the examples that you show and our page is that Ladd is a non-profit (ie. we have no product for sale, we don’t charge admission, and we’ve never spent a cent on advertising for Promoted posts.) We operate as a public museum; our page is used for astronomy and history of science education. Looking at our detailed Insights page our top city is Providence RI with 527 Likes, as one would expect, but the next most popular (in order) are: Mexico City 277, São Paulo 129, Tehran 128, Bogotá 123, Istanbul 98, Buenos Aires 96, and New York City 88. Notice first that Providence and the other cities are each a tiny fraction of our total Likes and also that the rest of the cities have much larger populations than Providence. If we were not open to the public locally or were based in a smaller city I could easily see our home location Likes being low enough to garner 2nd or 3rd place. Also, Facebook only counts countries and major cities, but not US states/counties or provinces. For the other three prominent cities in RI we have a total of 127 Likes and Boston has only 40, but that was only visible in the detailed spreadsheet. We also have quite a few Likes from suburban and rural communities in RI that do not show up in the detailed Insights spreadsheet at all, even though I know that there are a lot of local Likes. In short, huge population centers like Mexico City have an inordinate presence. The reason that I think this might be relevant to your analysis is that many companies in the northeast do not often locate in major cities. For example, Amgen has a presence in West Greenwich RI, Raytheon is in Middletown RI and Waltham MA, while CVS has a headquarters in Woonsocket RI which are low population communities that don’t even show up in my analysis. A quick Google search for “Invitrogen headquarters” gives me Carlsbad, CA which has a fraction of the population of Mexico City. So, I’m not convinced that city demographics are at all useful. I would want to see the total number of Likes from Mexico City before declaring it the Top city as FB claims. I’m not sure if any of this is comparable to your results due to the major difference in kind of FB page. But, my main point is that I have had great difficulty in extracting useful information from the Facebook Insights data. In particular the city data is quite confusing and unhelpful. However, I do agree that your country results appear skewed.